If aesthetics and/or cost is your primary goal, you may decide to use one of several types of wood instead of composite. Though most composite decking is designed to mimic the look and texture of wood, there’s an authentic feel to real wood that just can’t be replicated. While most varieties of wood will be less expensive than composite decking, don’t overlook future costs of routine upkeep such as annual staining, and board replacement over time. One way to get the organic beauty of wood with somewhat lower maintenance is to use deck boards with grooves mortised into their underside. This can dramatically reduce cupping and warping, and is recommended for high humidity environments like the Pacific Northwest. 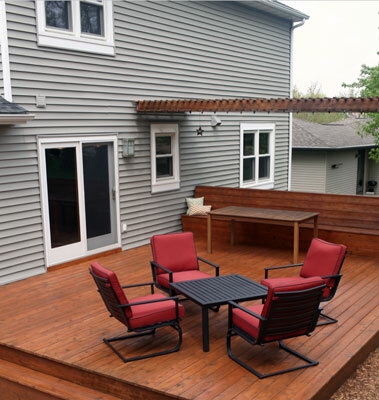 For experienced custom deck and fence construction in Bellevue and the Eastside, give Gem Qualities Remodeling a call. With multiple composite and wood decking materials to choose from, we can help you select what best meets your needs and budget. Gem Qualities also provides expert kitchen, bathroom and other remodeling services.